Star Wars: The Black Series - Mace Windu Lightsaber - Force FX - Episode III. ITEM IS DUE TO ARRIVE IN JANUARY. ITEMS HAVE ARRIVED A LOT SOONER THAN ORIGINALLY ESTIMATED. ONCE WE GET A CONFIRMED ARRIVAL DATE, WE WILL CONTACT ALL PRE-ORDER CUSTOMERS AND UPDATE THE LISTING. WE DO NOT HAVE ANY CONTROL OVER THE DISTRIBUTION OF THE ITEM, AND WE HAVE NO CONTROL ON ACTUAL RELEASE DATE. IF THE ITEM DOES NOT ARRIVE AS PER THE DISTRIBUTORS RELEASE DATE. Item ships the same day if ordered before 3pm EST. We package all our items with the greatest of care. We are not responsible for any item that arrives damage due to postal service/UPS mishandling. We do everything we can to describe the item as we see it here at our shop. Like our customers, we are also collectors, and we know the importance of box condition, so we do our best to pack the items in order for them to arrive in the condition they were described and sent from our shop. We do not possess pre-order items when listed. If an item is due to arrive within a specific month, please be aware that the item can arrive at any time during that month. After the 24 period, we will not be accepting cancellation requests. We will not let our customers wait longer than they should. 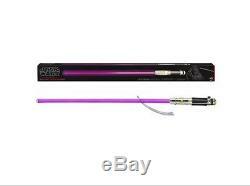 The item "Star Wars The Black Series Mace Windu Lightsaber Force FX Episode III" is in sale since Saturday, October 6, 2018. This item is in the category "Collectibles\Science Fiction & Horror\Star Wars\Products, Non-Film Specific\Lightsabers, Weapons". The seller is "popworldusa" and is located in Holbrook, Massachusetts. This item can be shipped to United States, Canada, United Kingdom, China, Mexico, Germany, Japan, Brazil, France, Australia, Denmark, Romania, Slovakia, Bulgaria, Czech republic, Finland, Hungary, Latvia, Lithuania, Malta, Estonia, Greece, Portugal, Cyprus, Slovenia, Sweden, South Korea, Indonesia, Taiwan, South africa, Thailand, Belgium, Hong Kong, Ireland, Netherlands, Poland, Spain, Italy, Austria, Israel, New Zealand, Philippines, Singapore, Switzerland, Norway, Saudi arabia, Ukraine, United arab emirates, Qatar, Kuwait, Bahrain, Croatia, Malaysia, Guatemala, Honduras, Jamaica.